To make it easier for students to get an overview of how things correlate to each other timelines are great tools. Math to show how math has developed over time. Science subjects for instance to get a better understanding of how evolution has changed the world and what´s living at different times or how different inventions have developed over time. Social studies for instance to understand and get a better overview of how politics have changed over time. Languages to show how language has developed over time, to show how/why some languages are related to each other while others are not. If you work as a teacher I´m sure you can come up with many more ideas where timelines are a good tool to use in education. Examples of different programs/sites/apps you can use to make timelines. Let the students do the creating of timelines. They will enjoy the lessons more, you´ll get timelines you can use in other classes and you don´t have to spend as much time to prepare your lessons. 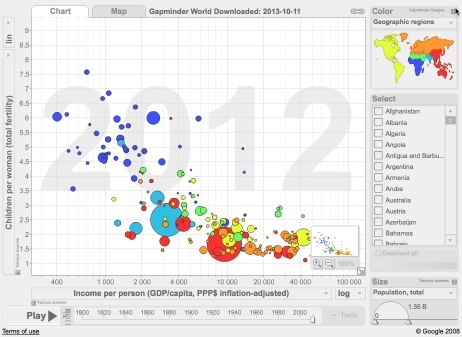 Gapminder world A statistical tool where you can compare different countries over time in a visual way. You can compare many different kinds of statistics. Works on Mac and PC. Download from the link above. Recommended! Here is a video of Hans Rosling when he´s using Gapminder. MyHistro Requires registration. There is an EDU-version that I haven´t tried. Stories displayed on a map and a timeline. There is a free iPhone app. Capzles Requires registration. Free. Visually the best looking timeline. You add pictures and movies to the timeline and you can add music as well. Is somewhat of a mix between a presentation tool and a timeline. You can tag the content, choose who that can watch the content, choose background and add blog posts. There is a chart, so you can see what other people have done. Tiki-Toki Requires registration. The free version is limited (one timeline/account). EDU-account is 124 dollars/year (a teacher licens and 50 student accounts where each student can make 5 timelines). Dipity Timelines online. A limited free version (only 3 timelines/free account) where you can link pics, video, social media and sound. Registration needed to get access. Preceden Registration needed to get access. Free version limited to 5 happenings/timeline. If you want to unlock full version it´s a onetime payment of 29 dollars. A textbased tool (you cannot add images and video). Readwritethink A very simple timeline where you write date and a text, next date, next text and so on. Easy to use, but limited result since it´s text only. There is a free app called RWT Timeline. Timetoast A free online tool that requires registration. You can create timelines with pictures and links to texts. Timeglider There is a limited free version that requires registration and it´s only free for students. They present their tool ”like Google maps, but for time”. Timerime A free online tool that requires registration. You can create timelines with pics, video and links. There is an EDU-version for €149/year. Timelinemaker Easy to use, but limited results. Suitable for younger kids. You fill in boxes and press a button and a timeline is generated. Ourtimelines Textbased tool. Uses strong colors, which reminds of Internet pages during early Internet.Text can link to other pages. World History A wallposter you can order that contains a timeline with very much historical information. Conflict History Doesn´t work since may 2013. They write that the page might resurrect with new technique, but its uncertain. If it does it seems like a page worth visiting! The page shows world conflicts on a world map and on a timeline. Amerian revolution Interactive timeline – A free app for iOS. Minds of modern mathematics – A free app that is a timeline over math history and persons that have contributed.